Whether you’ve been invited to a black tie gala, casino trip, or wedding, there’s something to be said for dressing sharper than usual. In fact, the mere act of wearing a suit elicits feelings of power which stops you worrying about the small things and changes the way you see the world, research from California State University reveals. But dress codes aren’t always so easy to work out and can leave you stressing over what to wear. Here’s how you should dress for your next formal event. If you’ve been invited to a black tie event, you should wear a dinner jacket (also known as a tuxedo jacket) along with matching trousers. It’s easier to buy a set since they’ll automatically be matching. While you can get away with wearing a regular white collared shirt, a wing-tipped shirt is traditional. You should also wear a bow tie — learn how to tie one or simply buy a pre-tied one. Then, you’ll need a waistcoat or cummerbund as we as black leather shoes. Make sure you give your shoes a regular polish so they always look the part. Higher-end casinos tend to have stricter dress codes, so it’s best to check the details beforehand. You may be asked to wear black tie (as detailed above) which is popular in casinos throughout Europe like the Monte Carlo and even at VIP events in Atlantic City and Vegas. If the dress code is black tie optional or semiformal, you could wear a dark suit, white shirt, tie, black socks, and smart shoes. However, most casinos allow casual clothing. Wear jeans, khakis, or cargo shorts in warm weather, along with a plain t-shirt, button-down, or polo shirt. As for shoes, trainers or loafers are fine, but you probably won’t be allowed in in sandals or flip flops. Men’s cocktail attire should be formal — but not too formal. Think along the lines of a dark suit in navy or charcoal paired with a light-coloured shirt and a nice patterned or textured tie. 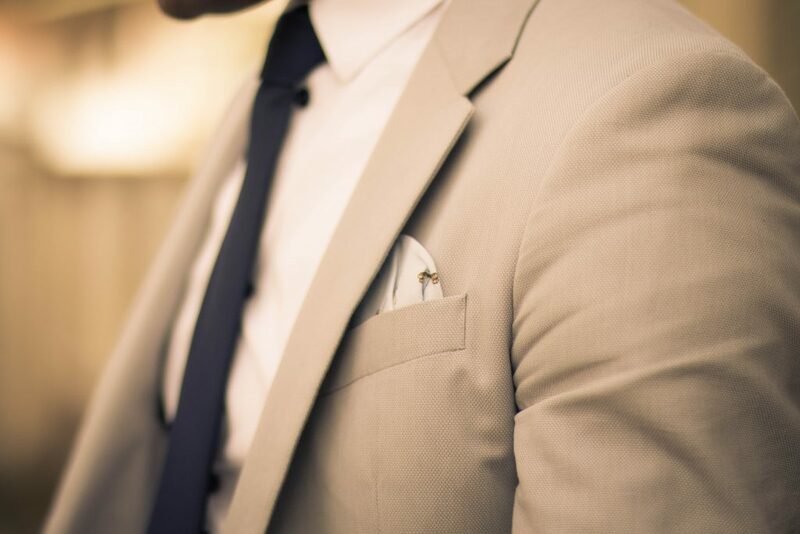 Finish your outfit off with a pocket square and simple black or brown leather lace up shoes. If the wedding’s in the summer, socks aren’t mandatory. Wedding cocktail attire allows for more individuality than more formal dress codes and you can inject some flair to suit your style. It’s not every day you get to dress up, so make the most of it when the occasion arises. While it’s important to invest in a solid wardrobe for special occasions, there’s no need to break the bank. Use this handy guide to put together a stylish and suitable outfit that’s within your budget.